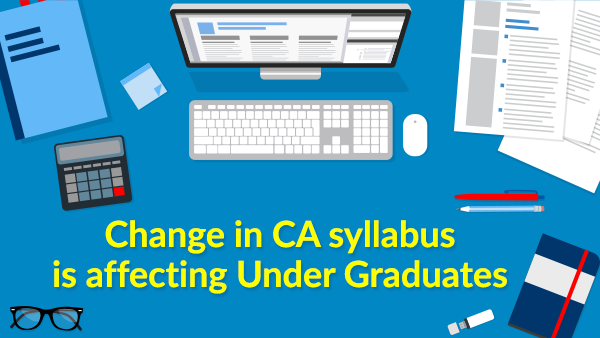 How will the change in CA syllabus by ICAI affect the Undergraduate Students? True they say, change is the only constant. Caught up in the winds of change, the CA aspirants enrolling for CA-IPCC (now changed to CA Intermediate) after 30th June, 2017 have had their feathers ruffled quite a bit. If you are one of them, you know exactly what we mean. With all the confusion on the go, we took the time out to stand in your shoes and see what actually hurts, and where. We know some of the thoughts that must be rummaging in your head: what does this change mean for me? Is it going to be good, bad or ugly? What has changed and what has not? Most of all, will it get more difficult (that it already was) to crack CA Inter? We hate to break it to you, but yes, cracking CA will become a tad harder under the new syllabus. The efforts put in will also have to be multiplied by two. But, hey! Don’t get disheartened just yet. That you are in rough waters right now is not necessarily bad news. With GST being introduced and other such powerful changes taking over, it was about time for altering the CA syllabus as per requirement. CA-IPCC is now CA Intermediate, and the scope of syllabus has changed, considerably. In case of CA Intermediate, a lot has been shifted around between Group 1 and group 2. Now you have 8 papers in place of 7. Subjects like Enterprise Information Systems and Economics for Finance have been added to provide an overall picture of industry while subjects like Communication and Ethics have been removed from the exiting IPCC course. But, How Will The Changes Affect The Undergraduates? Let’s take a closer look at the situation. Key topics like Admission, Retirement, Death of Partners, Goodwill, and NPO from core commerce subjects like Accounting has now been eliminated under the new syllabus. Does it mean you can live without them? Not really, you have to study them as a part of your graduation syllabus, anyway. Additionally, you will also have to study newly introduced topics for your CA Intermediate exam as well. Unlike in Graduation, new amendments and updates now form part of the new syllabus. Topics like General Clauses Act in Law, Financial Reporting of Financial Institutions, Mutual Funds and Consolidation have also been added. They have been thoughtfully included as it helps you prepare for the most recent and the applicable industry standards. Good in a way, no doubt, but for a graduation student it simply means that you will have to buckle up. To sum it up, with all the inclusions and deletions, the CA Intermediate Syllabus has largely changed from the existing CA-IPCC and the various topics that you have to study now do not coincide much with the graduation syllabus. Without the perfect mapping of course contents (which had largely help the CA aspirants until now), you have more topics to cover thus creating more pressure on you than normal. The changes in the syllabus will do you more good than harm in the long run. For one thing, when you clear CA under the new syllabus, it will put you at par with existing chartered accounts practicing for several years. Under the influence of change in the economic system, even they have to learn certain things from the scratch. But what can you do? Well, you can’t change the direction of the wind but you can set your sails accordingly. Neither complaints nor regrets will help. And, fretting and panicking will only add to your agonies. So we suggest you take a deep, long breath. As long as you study systematically and simultaneously, you should be just fine. Prepare for both groups together. To pace up your preparations, enroll with CAprep18 where you will be provided with simultaneous coaching for both the groups at the comfort of your home and an extended validity option.